You landed on Frog Island and want to leave…. Against the marker is a SCYTHE. Take it and walk to the south. Look at the frog. Talk to it. It wants to come with you as soon as it has eaten. First we have to find something to eat. Look at the tree. There might be a loose twig. Push the tree and a twig falls out. Take the TWIG. Walk to the north to the bridge. There’s a French guard. He won’t let you pass and is also hungry. Maybe we can give him frog? No, not really. Leave to the north again and go to the right to get back to the path. To the left is the beach. Let’s go there. A sad man is standing there. Talk to him and ask why he’s sad. His banjo is broken. If you can fix it, you’ll get a bottle of alcohol. You take the BANJO. Look at it. Use the twig on the banjo and you’ve fixed it. Even more: you got a GRENADE out of the banjo. Give the banjo back to the sad man and he’ll give you the BOTTLE. The little kid is making a sand castle. Talk to the kid, it won’t answer. So you can easilly ask for the SHOVEL. Just take it. Leave the beach on the right and go south again, back to the frog. On his left is a strange looking pile. Use the shovel on the pile to reveal a number of worms. If we want to take them, we need something to put them in. Let’s open the bottle. Use the scythe on the bottle but be carefull.. The bottle broke. But at least you can take the WORMS with you by using the broken bottle on the worms. Walk to the right again and at the intersection, take the path to the right, to the river. There’s a strange yellow coloured shrubbery in the grass. 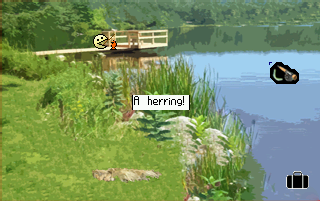 Use the scythe to cut the shrubbery and find a FISHING POLE. Pick it up, use the worms on the pole and use the pole on the water. You’ll walk to the platform since that’s the best spot to throw the line. After a bit you catch….. a red HERRING. Leave the screen to the left and walk to the south, back to the frog. Give the fish to the frog and it’ll come along with you on your journey. Walk to the north to the bridge. How to get rid of the guard? He’s still hungry and you can’t attack him just like that. Use the grenade from your inventory with the frog. It was big enough en now the frog has eaten the grenade. Give the frog to the guard and tell him they are frog legs. He’ll eat them right away. Then warn him about the grenade and he’ll run off.